in the atmosphere and weeks in the ocean. Among these are diurnal and semidiurnal oscillations arising from diurnal changes of insolation and the gravitational forces of the Moon and the Sun. 4. Global variations, with periods ranging from weeks to months. Two-week variations of the circulation index (the mean angular velocity of the atmospheric rotation in temperate latitudes with respect to the Earth's surface) and 30- or 60-day oscillations in the Indian and Pacific sectors of the tropical atmosphere may serve as examples. 5. Seasonal variations, with annual periods, and their harmonics (including monsoon phenomena). 6. Interannual variations, with periods of several years. Among these are the quasi-two-year global variations of meteorological elements, particularly in the equatorial stratosphere (according to Obukhov they occur as the result of parametric resonance, that is, resonance amplification of annual oscillations with slowly changing atmospheric parameters over time and with rare changes in phase of oscillations by 180 degrees), quasi-two-year phenomena ENSO (El-Nino - Southern Oscillation), 3.5-year auto-oscillations of the northern branches of the Gulf Stream, and so on. 7. Intra-centennial variations, with periods of tens of years; rising temperature during the first half of the current century provides a typical example. 8. Inter-centennial variations, with periods of several centuries or tens of ages. They manifested themselves in rising temperatures after the end of the glacial period, (centuries 90-60 BC), the setting-in of the so-called 'climatic optimum' in centuries 40-20 BC, a subsequent fall in temperature (tenth century BC to third century AD), a further rise in temperature during the fifteenth and sixteenth centuries, and, finally, a fall in temperature during the so-called 'small glacial period' (seventeenth to nineteenth centuries). 9. Long-period oscillations, with periods of tens of thousands of years (glacial and interglacial epochs of the Pleistocene), related to changes in the parameters of the Earth's orbit and inclination of the Earth's axis. Among oscillations of this kind, which are of astronomical origin, an oscillation with a period of 100 thousand years is the largest. Then, as the amplitude decreases there are oscillations with periods of 22 and 41 thousand years. The first of the above three periods is close to the Earth's orbit eccentricity change; the second period coincides with the period of precession; and the third period coincides with the period of inclination of the Earth's axis. 10. 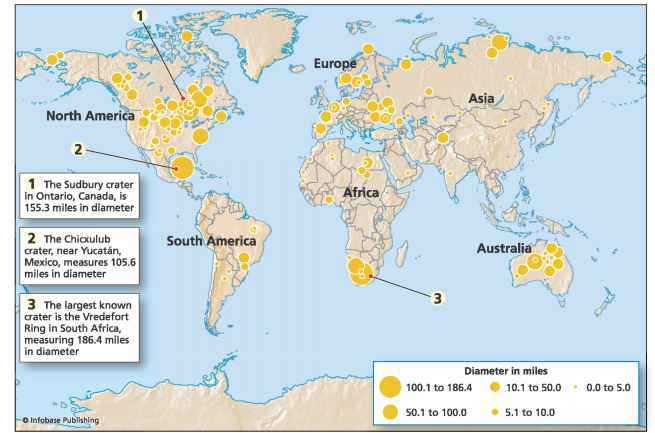 Geological changes, with periods of tens and hundreds of millions of years created by orogenesis and tectonics, and by the drift of continents. 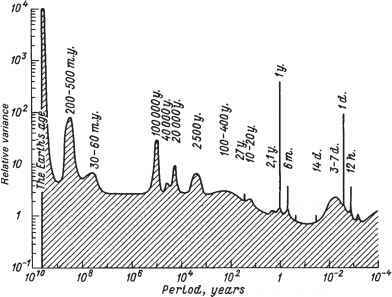 Figure 1.1 Idealized spectrum of the surface air temperature, according to Mitchell (1976). into forced and free ones. Oscillations generated by external forcing (say, insolation changes) are termed forced oscillations; oscillations taking place independently of external mechanical or thermal forcing and determined by the internal instability of the climatic system with regard to small disturbances (for example, auto-oscillations in the ocean-atmosphere system) are termed free oscillations. The basis of this classification can be reduced to the following, according to Lorenz (1970). In any real hydrodynamic system there is always viscous dissipation if the system does not move as a solid body, and thermal dissipation (average rate of degeneration of temperature non-homogeneities) if the system is not isothermal. Hence, in free oscillations the only mechanism which can balance the dissipation effects is energy transfer over the spectrum; in forced oscillations the dissipation effects can be compensated for at the expense of both cascade energy transfer and the work performed by generating forces. In the second case, the mode having the same length scale as the generating force is excited first of all. Then, because of instability, this mode transfers its energy to higher-wave modes. As soon as the energies of these modes approach a critical level the still higher-wave modes are excited. At the same time the high-wave modes have a reverse action on the low-wave-generating modes, resulting in amplification, or stabilization, and even destruction, of the low-wave-generating modes. 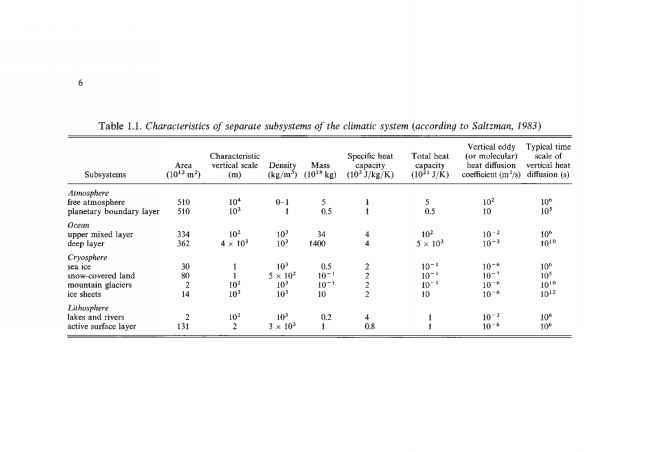 From the above it is clear that external forcing is only one of the possible variability mechanisms; the other is the internal stochastic mechanism determined by the existence of feedbacks between different internal parameters of the climatic system. Feedbacks can either amplify variations of interacting parameters or attenuate them. In the first case they are called positive feedbacks, and in the second case they are called negative feedbacks. There are many familiar examples of feedbacks. Let us discuss some of them. The positive feedback between the greenhouse effect of water vapour and the atmospheric temperature. The amount of water vapour in the air (absolute humidity) is a non-linear function of air temperature, and this in its turn determines the atmospheric transparency to long-wave radiation. Thus, a rise in temperature at constant relative humidity (the assumption about the constancy of relative humidity is justified over a wide range of temperature changes) leads to an increase in the absorption of long-wave radiation in the atmosphere (the greenhouse effect), and thereby contributes to a further rise in temperature in the low atmosphere. In other words, the greenhouse effect of water vapour has a destabilizing effect on the climatic system. The positive feedback between the albedo of snow and ice cover and the atmospheric temperature. It is common knowledge that ice and snow have higher reflective capacity (albedo) than water or soil. Therefore, an increase in the area of snow and ice cover, or in their lifetimes, has to be accompanied by an increase in the planetary albedo, and this is accompanied by a decrease in the solar radiation assimilated by the climatic system, and a subsequent increase in the snow and ice cover area. The positive feedback between the greenhouse effect of carbon dioxide and the surface air temperature. An increase in C02 in the atmosphere arising from the burning of fossil fuel leads to a rise in temperature as a result of the greenhouse effect of carbon dioxide. In its turn the rise in surface air temperature accompanying an increase in the downward flux of long-wave radiation, and a decrease in sensible and latent heat fluxes (temperature contrast of water-air decreases) contributes to the warming of the ocean surface. This enhances the vertical stability of the upper ocean layers, decreases the absorption of carbon dioxide and eventually favours an increase in C02 in the atmosphere. The negative feedback between the equator-to-pole temperature difference and the meridional heat transport. An increase in the equator-to-pole temperature difference results in enhancement of the meridional heat transport, which leads to a rise in ocean and atmospheric temperatures in high latitudes and, hence, to a decrease in the equator-to-pole temperature difference. The negative feedback between soil humidity and albedo of land surface. A rise in soil humidity results in a decrease in land surface albedo which, in its turn, leads to an increase in absorption of short-wave solar radiation, a rise in temperature of the underlying surface, an increase in evaporation and, as a result, a decrease in soil moisture. The negative feedback between air temperature and cloudiness. Radiation properties of clouds are defined by the albedo, height and temperature of their upper and lower boundaries, the amount of cloud and optical thickness. These factors generate simultaneous changes in short-wave and long-wave radiation so that the resulting effect of cloudiness can lead to both a rise and a fall in the temperature of the underlying surface and surface atmospheric layer, that is, it can manifest itself as positive and negative feedbacks. The positive feedback is created by an increase in the greenhouse effect with a preceding increase in the downward long-wave radiation flux, a rise in the underlying surface temperature, an intensificiation of evaporation, an increase in the water vapour content in the atmosphere and cloudiness; the negative feedback is generated by an increase in planetary albedo and a reversal of the short-wave solar radiation assimilated by the climatic system. Increasing amounts of lower-level cloud and decreasing amounts of upper-level cloud contribute to the appearance of negative feedback. We have discussed two mechanisms of variability of the climatic system: its inherent internal stochasticity and external forcing. The third mechanism comprises the different forms of resonance between internal modes of the climatic system and external forcings of cyclic character. The oscillations of paleoclimatic indicators, with periods of ~ 100 000 years coinciding with periods of oscillation of the Earth's orbital eccentricity serve as a good example. There are several known explanations for this feature in the spectrum of paleoclimatic indicators, including resonance amplification of forced oscillations that relate to the internal variability of the climatic system. Following Lorenz (1970, 1979) we assume that the internal stochastic mechanism makes an essential contribution to the variability of the climatic system for all time scales and that this mechanism consists of individual stochastic processes, every one of which has its own time scale and introduces its own contribution (white noise) to the variability, characterized by all time scales exceeding the given one. This defines the existence of the 'background' variability (shaded area in Figure 1.1) and the increase in its intensity with increasing time scale of oscillations. The most important factors controlling the 'background' variability on time scales of the order of one hour and less are small-scale turbulence and convection, and on time scales of the order of one day - inertial waves. On time scales of the order of one month the background variability is determined by the thermal relaxation of the atmosphere. On time scales of the order of one to ten years it is governed by thermal relaxation of the upper mixed layer of the ocean, and on time scales of the order of ÍO'-IO3 years it is dictated by processes in the deep ocean. Finally, in the range of timescales from 103 to 10s years an interaction between the continental ice sheets, deep ocean layer and the atmosphere manifests itself. External forcing results in the generation of narrow band variability. Hence in the presence of external forcing, and the absence of the 'background' variability the spectrum of climatic variability would resemble the superposition of variations featuring various external factors. Such variations have a high degree of ordering and, therefore, a high degree of predictability. In contrast, the 'background' variability is characterized by a low degree of ordering and predictability.